There is a new experience with a dilution containing information from the 6th chakra. The chakra of the third eye is located in the highest place of the physical organism (7th chakra is already above the organism). It is often mentioned in the Asian religious and philosophical systems. Also Descartes, whom many believe to have been the founder of the modern science, paid special attention to this area of the brain, where the pineal gland is found and which he believed to be the place where the body and soul meet. Also physiologists consider this small organ to be very important, because it steers the activity of the hormonal system in the body. It is the simplest method for the preparation of the autopathic dilution. We cover our mouth and nose with a safety mask, take the autopathy bottle out of its cover, tilt it so that the tubes point upward in the form of the letter V, fill the round part with water. We hold the bottle in place, where the inflow-tube changes into funnel. We hold the round part containing the water for approximately 2 minutes in the area above the root of the nose, with its centre above the inner ends of the eyebrows. The glass can touch the skin. We pour 1 litre water through the bottle. Then we return the round part of the bottle containing the water back to the same place above the root of the nose as during the collection, for one minute. Then we discard the water, put the bottle back in its packaging and take off the safety mask. Other things concerning the preparation are basically the same as in the instructions for Prana 5. I have first tested it on myself five months ago, as I usually do when something new comes up. Nevertheless, my seventy-year-old organism may not always offer the best example of what the same thing will do with much younger people, for example fifty or thirty-year-old ones. And so I have written about it to my friends engaged in autopathy. 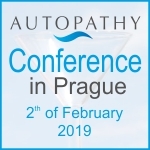 Month and a half later, Veronika Kucerova, a psychologist from Pilsen, spoke at the 10th conference on autopathy in Prague about its effect on her and her friends. For example, in one case, use of a potency from 2 litres was followed by a headache, which then immediately after the reduction of the amount of water to 1 l disappeared. This new method was then discussed at the conference by very interested participants. Logically it seemed that the dilution from the 6th chakra can do a lot, because the 6th chakra influences all other lower chakras subordinated to her. Amongst other things also endocrine glands. And, most importantly, there is already much experience with dilutions from the 7th chakra. Up to now, this form of preparation was discussed only at the conference, however, I have met people at various lectures and seminars, who have tried it. For example, at the spring seminar it was mentioned twice. One young woman reported about how she has been healing herself over 2 years with various potencies of autopathic dilutions using various forms of preparation, however, her psychic condition was not much better. Then she made Prana VI from 1 litre and nothing changed and so in two days she made Prana VI from 2 litres, again nothing unusual happened and so she continued with 3 litres, again nothing. Then she made dilution from 4 litres and since this time she has been feeling the best she has ever felt in her lifetime. Another contribution from the spring seminar: A woman has been working since a long time as a consultant in autopathy, she is about 60 years old, had lectures at conferences, not long ago made herself a dilution from Prana VI. She collected from the front and from the back (the back opening of the 6th chakra), she moved the bottle around her head, and after diluting applied it in the say way, she also moved down along her chakras and then up again, ending with the 6th chakra. Then she got into an unusual state, a feeling of oneness with the Universe, she cannot describe it, she sat without moving for about half an hour, it was wonderful, until her husband disturbed her, who had wondered what is happening to her. Since then she has been feeling excellently. She used 6 litres directly. However, she has been using autopathy since many years. I have met a number of other people, who have tried this form of preparation after the conference. They reported various things, for example calming down, reduced emotional reactions in stress situations, better sleep since weeks – an improvement preceded by one sleepless night, etc. Until now, we do not know much about the influence of the 6th chakra, the observation has been too short. Nevertheless, many have concluded that it is worth a try. Others report an exceptionally good effect. It is advisable to start in all cases with one litre (1/2 litre for very week vitalities) and to wait three days. When no improvement takes place in mental or physical feelings, increase on the 4th day by 1 litre. Go on using this procedure. Until we find a potency, after which some of the feelings change for the better. We wait and observe and repeat the same single potency only then when the effect disappears. When the functioning potency no longer works and repeating does not bring any effect, we increase by 1 litre and wait. I write Prana VI with Roman numerals to avoid confusion with P5 and P2, dilutions from the 7th chakra – see literature (analogically, dilution from the 5th chakra would have been P V., from solar plexus P IV and so on). Because of the short observation period, it is still in an experimental stadium, with a possibility to return to the tried and tested forms of preparation described in the books, and especially to that, which functioned the best in the past for the concrete person. Prana VI can also be used in an alternating application of a preparation from physical information or with P 5. If you already have experience with this new form of application and want to share it with others, you can send it to us for publication at autopathy.info. Sharing information is actually the only way, how autopathy can develop further and provide greater help to more people. We shall see, if Prana VI will be added to the standard methods commonly used since years.